Minnesota-based poker player Jonathan Cyril Collins, a three-time winner of National Deaf Poker Tour events, was killed last month in Las Vegas, according to court documents made public this week, the Associated Press reported Wednesday. The 39-year-old Collins and his girlfriend drove to Las Vegas to meet with a man Collins knew only by first name to buy 10 pounds of marijuana, according to police. The couple apparently fell into a robbery attempt, which resulted in one of the suspects shooting Collins while he was in his car, authorities said. Collins’ girlfriend remained at the scene as the suspects fled. Collins died in his car from a gunshot wound to his chest. On May 28, police arrested Rufus Anthony Smith III, 27, on murder, conspiracy and kidnapping charges, according to the report. Authorities are still searching for the second man. “Jon played in many other tournaments all over the country and took his play seriously,” the National Deaf Poker Tour wrote in a Facebook post. 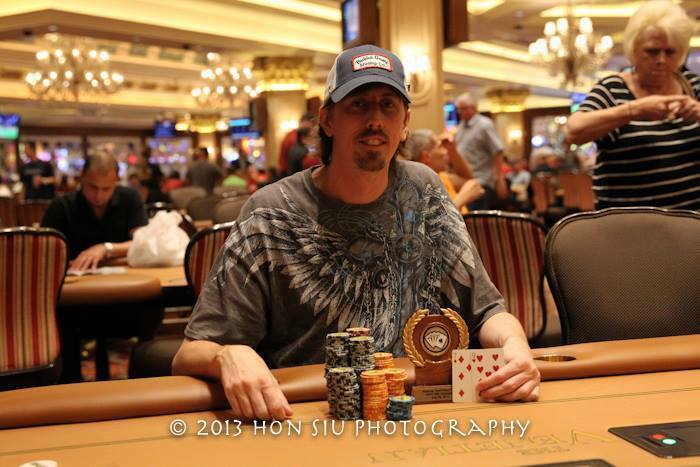 “He was always open to talking strategy and coaching players—which made him a popular person on the Deaf Poker Tour and will be missed by many as evidenced by the tributes pouring in. RIP Jon Collins.” The NDPT added that his family has an online fundraiser to help cover his funeral expenses. Collins had lifetime tournament earnings of $83,757.